On the Qt – Imagine, create and inspire!!! Why go wide? 108″ wide fabrics! Whether you are new to sewing or a pro, we have all been there… “My machine is broken!” According to Mike (QT Sewing Salesman) and his shop friends that service machines all the time, not necessarily! Mike’s back with some tips from his shops, some really technical terms (joking) and a head’s up on what to check before you bring your machine in for servicing. Exceptional service, tips and tricks are always available at machine dealers and quilt shops, and we definitely encourage you to go and become friends! Servicing your machine is important (just like getting your car inspected and maintained!) and is worth the investment. However, some things can be simple and you will save yourself some time, money, and feel like a superstar with these tips! This is Tiffany, Creative Manager at QT, and I made fast friends with the gentleman (Joao) who serviced my Industrial Singer walking foot machine! Well, I was his friend but he probably thought of me as “that girl” 🙂 I bought it used from a factory in Fall River, MA, received an hour tutorial on threading and basic machine maintenance, and off I went excited to bring it home and create amazing upholstery projects! Day 1 – I went to sew a sofa cushion and my machine was “broken” I didn’t get more than 4 inches in and had to call for help. The thread was bunching and jammed the needle… I was told to bring in the beast of a machine for Joao to take a look. Long story short – I made several visits and signed up for lessons with Joao because the machine was perfectly fine; it wasn’t a machine problem, it was operator error (or as I prefer to say, operator inexperience). Like learning to drive a car, you should get to know and learn about your machine, it’s quirks, best ways to change gears and how to maintain it properly. That is why your machine dealer or local service is so important! 10 years of upholstery work and this machine and I are BFFs and have made some magical projects together! We hope you enjoy these QT Sewing Salesman Tips. Make sure you join our QT Fan Group and follow us on Instagram @QTfabrics to stay on top of our newest collections and fun with fabric! Last week’s winner of the Sewing Tip Blog is Robin Noel! We sent you a message on Facebook! 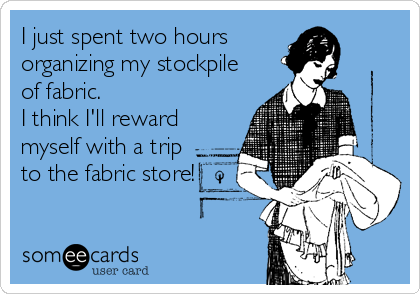 Please let us know your address so we can send you some fun fabrics! We agree and think the fun is in the process not in perfection! Lazy Girl Designs – Sew Inspired! Saturday with QT’s Sewing Salesman! Week 8 – Finale!